Rings of plum slices make an elegant topping for this yeast coffee cake. 1 of 8 Heat together the milk and 1 teaspoon of the sugar in a small saucepan until the temperature registers 105 degrees F to 115 degrees F on an instant-read thermometer. Remove saucepan from heat. Sprinkle the yeast over the top of the milk. Let stand for about 5 minutes. Stir to dissolve the yeast. 2 of 8 Meanwhile, mix 2 cups flour and salt in medium-size bowl. Whisk egg, oil and honey in small bowl. Whisk 1/3 cup flour into egg mixture; stir in yeast mixture. 3 of 8 Add egg mixture to flour mixture; stir until dough comes together. Transfer dough to floured surface. Knead 5 minutes, using as much of remaining 1/4 cup flour as needed to prevent sticking. 4 of 8 Transfer dough to greased bowl, turning dough to coat. Cover bowl loosely with parchment or waxed paper and clean kitchen towel. Let rise in warm place, away from drafts, for 1-1/2 to 2 hours or until doubled in bulk. 5 of 8 Punch down dough; let rest for 3 minutes. Coat 8-1/2-inch round springform pan with nonstick vegetable-oil cooking spray. Pat out dough on lightly floured surface. Fit into bottom of prepared springform pan. 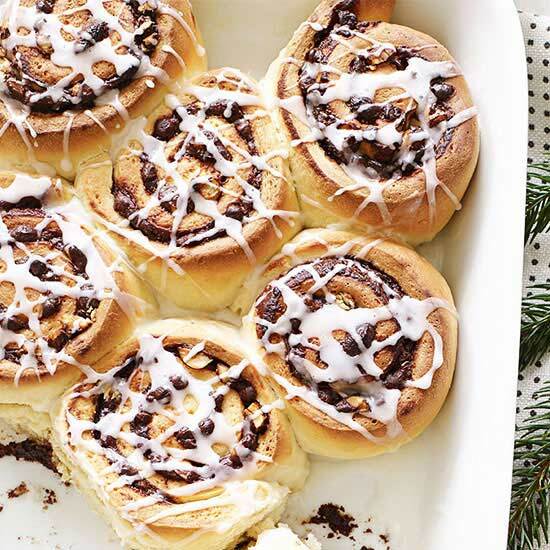 Cover pan with with plastic wrap; refrigerate overnight. 6 of 8 Remove the springform pan from the refrigerator; remove the plastic wrap. Heat oven to 375 degrees F.
7 of 8 Slice the plums in half. Remove the pits and discard. Slice each plum into 12 equal slices. Fan the plum slices in concentric circles over the top of the dough. Sprinkle the plum slices evenly with the remaining 1 teaspoon of sugar. 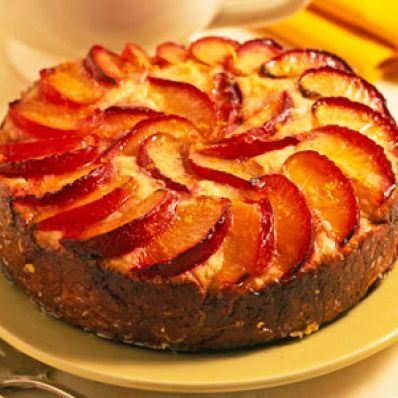 8 of 8 Bake in 375 degrees F oven 40 to 45 minutes or until the edges of the cake are browned and the plums are soft. Let the cake cool in the pan on a wire rack 10 minutes. 1 of 4 Meanwhile, bring the sugar and water to boiling in a small saucepan over medium-high heat. Reduce heat to medium; simmer for 5 minutes. Remove saucepan from heat; let cool. Stir in the lemon rind. 2 of 4 . Run a thin knife around the sides of the springform pan. Release the side of the pan and remove. Brush the top of the cake with the glaze. Serve the cake slightly warm. 4 of 4 Make-Ahead Tip: The finished cake can be refrigerated, covered, for up to 2 days.